Hepatitis is the inflammation of the liver caused due to a viral infection. Hepatitis is one of the leading causes for health care burden in developed as well as developing countries. As per the WHO, around 1.75 million new HCV infections occur each year, and approximately 399,400 deaths were caused due to HCV in 2015. Increase in the usage of unsterilized equipment and infected syringes, medication errors, and transfusion of infectious blood are leading to an increase in the incidence of viral diseases such as Hepatitis C. This, in turn, is likely to fuel demand for hepatitis therapeutics across the globe. The global hepatitis therapeutics market was valued at US$ 22,049.2 Mn in 2017. It is projected to expand at a CAGR of 2.3% from 2018 to 2026. The global hepatitis therapeutics market has been segmented based on disease type, drug class, distribution channel, and region. In terms of disease type, the global market has been categorized into hepatitis A, hepatitis B, hepatitis C, and others. The hepatitis C segment is anticipated to account for a major share of the market over the forecast period, owing to a high incidence rate of hepatitis C across the globe. Based on drug class, the global hepatitis therapeutics market has been classified into NS5A inhibitors, nucleotide analog reverse transcriptase inhibitors, nucleotide analog NS5B polymerase inhibitors, multi-class combination, interferon & ribavirin, and others. In terms of distribution channel, the global market has been divided into hospital pharmacies, retail pharmacies, and others. 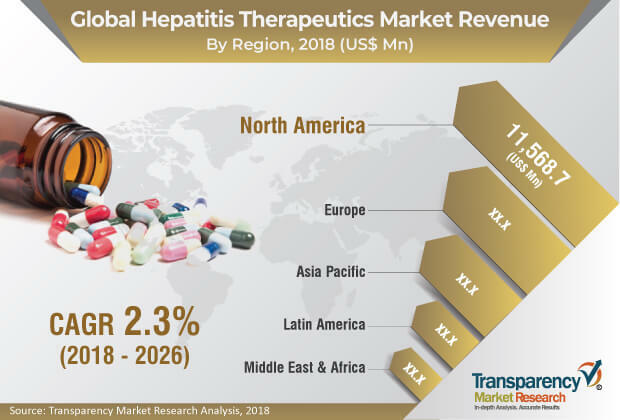 In terms of region, the global hepatitis therapeutics market has been segmented into North America, Europe, Asia Pacific, Latin America, and Middle East & Africa. North America accounted for a major share of the global market in 2017. Rise in the incidence of and mortality caused due to hepatitis and increased spending on drugs for the treatment of hepatitis in the U.S. are likely to boost the hepatitis therapeutics market in the region. Europe is anticipated to account for a significant share of the global market between 2018 and 2026. The presence of well-established infrastructure, rise in demand for hepatitis drugs for the early treatment of the disease, and high viraemic prevalence in Eastern Europe are expected to fuel the growth of the market in the region during the forecast period. The market in Asia Pacific is likely to expand at a significant CAGR during the forecast period. Increasing prevalence of chronic hepatitis C in developing countries such as China and India and favorable government initiatives for creating awareness about hepatitis are projected to propel the market in the region in the next few years. Key players operating in the global hepatitis therapeutics market include Gilead Sciences, Inc., Bristol Myers Squibb, F. Hoffmann-La Roche, Ltd., Merck & Co., Inc., LAURUS Labs, Zydus Cadila, AbbVie Inc., Cipla, Inc., Hetero Healthcare Limited, and NATCO Pharma Limited. These companies focus on developing novel drugs for the effective treatment of chronic hepatitis to enhance market foothold. The global hepatitis therapeutics market report comprises an elaborate executive summary, which includes a snapshot that provides information about various segments of the market. It also provides information and data analysis of the global market with respect to segments based on disease type, drug class, distribution channel, and region. A detailed qualitative analysis of drivers and restraints of the market and opportunities has been provided in the overview section. Additionally, the section comprises company profiles with product portfolio to understand the competitive landscape in the market. This section of the report also provides market attractiveness analysis, by region, and market share analysis, by key players, thereby presenting a thorough analysis of the overall competitive scenario in the global hepatitis therapeutics market. The global hepatitis therapeutics market has been segmented based on disease type, drug class, distribution channel, and region. In terms of disease type, the global market has been segmented into hepatitis A, hepatitis B, hepatitis C, and others. Based on drug class, the global hepatitis therapeutics market has been categorized into nucleotide analog reverse transcriptase inhibitor, NS5A inhibitor, multi- class combination, nucleotide analog NS5B polymerase inhibitor, interferon & ribavirin, and others. Based on distribution channel, the global market has been divided into hospital pharmacies, retail pharmacies, and others. The market value and forecast for each of these segments have been provided for the period from 2016 to 2026, along with their respective CAGRs for the forecast period from 2018 to 2026, considering 2017 as the base year. The global hepatitis therapeutics market has been segmented into five major regions: North America (the U.S. and Canada), Europe (the U.K., Germany, France, Spain, Italy, and Rest of Europe), Asia Pacific (India, China, Japan, Australia & New Zealand, and Rest of Asia Pacific), Latin America (Brazil, Mexico, and Rest of Latin America), and Middle East & Africa (GCC Countries, South Africa, and Rest of Middle East & Africa). The Market Value and forecast for each of these regions and countries/sub-regions have been provided for the period from 2016 to 2026, along with their respective CAGRs for the forecast period from 2018 to 2026, considering 2017 as the base year. The research study also covers the competitive scenario in these regions. The report also profiles major players in the global hepatitis therapeutics market based on various attributes such as company overview, financial overview, product portfolio, business strategies, recent developments, and SWOT analysis. Major companies profiled in the report are Bristol Myers Squibb, Gilead Sciences, Inc., Merck & Co., Inc., F. Hoffmann-La Roche, Ltd., LAURUS Labs, AbbVie Inc., Hetero Healthcare Limited, Zydus Cadila, Cipla, Inc., and NATCO Pharma Limited.